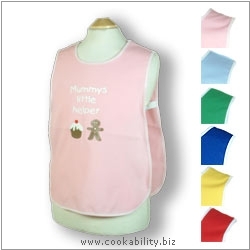 A smart range of colourful tabards. Made from polycotton for durability. All edges hemmed. Iced Muffin and Gingerbread man motif. Elasticated underarm bands to ensure a good fit. To fit a four - five year old.